Description: Tom believes, even in this cynical modern world, in the notion of a transforming, cosmically destined, lightning-strikes-once kind of love. Summer doesn't. Not at all. But that doesn't stop Tom from going after her, again and again, like a modern Don Quijote, with all his might and courage. Suddenly, Tom is in love not just with a lovely, witty, intelligent woman -- but with the very idea of Summer, the very idea of a love that still has the power to shock the heart and stop the world. The fuse is lit on Day 1 when Tom, a would-be architect turned sappy greeting card writer, encounters Summer, his boss's breezy, beautiful new secretary, fresh off the plane from Michigan. Though seemingly out of his league, Tom soon discovers he shares plenty in common with Summer. By Day 31, things are moving ahead, albeit "casually." By Day 32, Tom is irreparably smitten, living in a giddy, fantastical world of Summer on his mind. By Day 185, things are in serious limbo -- but not without hope. And as the story winds backwards and forwards through Tom and Summer's on-again, off- again, sometimes blissful, often tumultuous dalliance -- all of which adds up to a kaleidoscopic portrait of why, and how, we still struggle so laughably, cringingly hard to make sense of love and to hopefully make it real. We never remember in chronological order, especially when we’re going back over a failed romance. We start near the end, and then hop around between the times that were good and the times that left pain. People always say “start at the beginning,” but we didn’t know at the time it was the beginning. 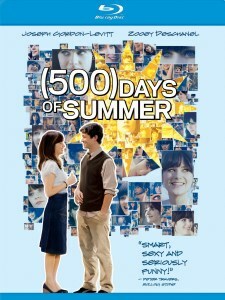 "500 Days of Summer" is a movie that works that way. Some say they’re annoyed by the way it begins on Day 488 or whatever and then jumps around, providing utterly unhelpful data labels: "Day 1," "Day 249." Movies are supposed to reassure us that events unfold in an orderly procession. But Tom remembers his love, Summer, as a series of joys and bafflements. What kind of woman likes you perfectly sincerely and has no one else in her life but is not interested in ever getting married? Zooey Deschanel is a good choice to play such a woman. I can’t imagine her playing a clinging vine. Too ornery. As Summer, she sees Tom with a level gaze and is who she is. It’s Tom’s bad luck she is sweet and smart and beautiful — it’s not an act. She is always scrupulously honest with him. She is her own person, and Tom can’t have her. 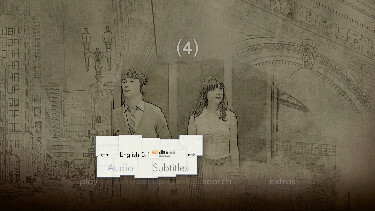 500 days of Summer appears on Blu-ray from Fox in a 1080P, AVC encoded, 2.35:1 transfer. The image is slightly thick and not notably detailed. There is textured grain visible, but much more so in the 1:33 shots of flashbacks or black + white mock-ups of vintage classics (mini Godard and Bergman homage). This is dual-layered and while doesn't explode with 1080P glory - I do get the impression we are viewing a faithful representation of the theatrical. Being the bittersweet humanistic comedy that it is - the visuals don't take as high a priority as in other genres. Colors seem intentionally flatter (heavy use of blue) to add to the film's intended 1950-ish look and feel (although the film is NOT set in that era) - and it is darker overall. Skin tones seem more yellow/orange that one might expect. This Blu-ray appears as an authentic representation although it won't knock your socks off with the pristine beauty of the image quality. It is fairly tame visually but this Blu-ray supports the film well enough - producing a consistent viewing standard with good contrast. It's middle of the road not - neither being lackluster or brilliant. It certainly works for the film though. 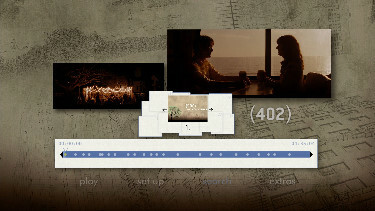 The DTS-HD Master 5.1 at 3405 kbps is never really pushed to the max with this mostly dialogue driven film. It comes more into play for the film's music - a light breezy score by Mychael Danna + Rob Simonsen and a ton of tracks from Simon & Garfunkel Hall to Oats to The Clash. It sounds flawless. There are optional subtitles and my Momitsu has identified it as being a region 'A'-locked disc. Extras are extensive with many being exclusive to the Blu-ray (so NOT on the simultaneously released SD-DVD). The audio commentary with director Marc Webb, the writers Scott Neustadter + Michael H. Weber and actor Joseph Gordon-Levitt is a fun affair with some laughs and pauses before the next humorous note is struck. Webb gives some production information and the writers give some input claiming about 75% of the film was based on things that really happened. It's fun to see them pause and talk about Zooey Deschanel - or, at least her bright visage. 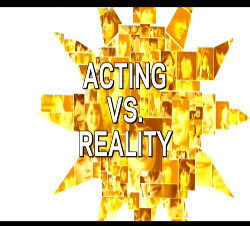 The grouping argue about interpretations of small issues in the film and discuss relationships frankly. It's a decent listen. 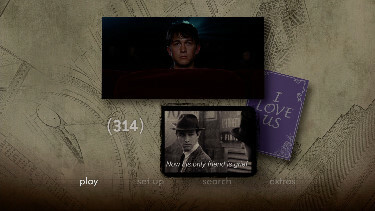 There are 15-minutes of 9 deleted and extended scenes with optional audio commentary. There are 7 minutes of inconsequential audition tapes with Geoffrey Arend and Matthew Gray Gubler. There is more than an hour's worth of other tidbits including 2 Storyboards sequences with optional commentary, Making of... entitled Not a Love Story: Making (500) Days of Summer, Summer at Sundance footage and six conversations with Zooey and Joseph last 12-minutes. What was kind of cool - and I wished was longer were the 'Filmmaking Specials'. The Webb's Bank Dance short film and the amusing Mean's Cinemash: Sid and Nancy piece were very cool expanding on scenes from the film. Both could have been much longer but I imagine some real work went into producing these. There is a music video and you get a Digital Copy disc for use with your portable devices. This is a very good film. While my reaction as not as exhilarating as some of the critical response that I've read - I do admit that this is amusing and very 'real' in a certain sense. It balances between showing some depth of the human condition and being just being light, fluffy and entertaining. The Blu-ray does the job but don't expect the A/V to approach demo levels. It's not that type of film anyway - but is IS recommended for its strong qualities as being quite memorable (Dance sequence in the park is GREAT!) with plenty of supplements to indulge in.